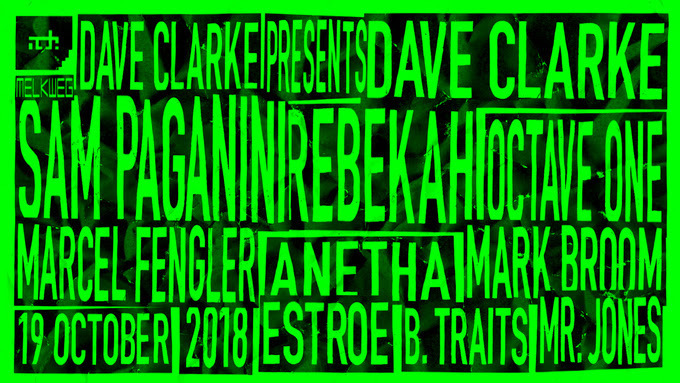 Sam Paganini, Rebekah, Anetha and Marcel Fengler are among the acts who will join Dave Clarke when he hosts his annual night at Melkweg as part of Amsterdam Dance Event 2018. The 14th edition of Dave Clarke Presents on Friday, October 19th will also Mark Broom, B.Traits, Estroe and Mr. Jones get behind the decks plus Octave One live. Alongside Presents, Dave Clarke will host a Whip It night of electro - details to be released soon. For tickets and details of Dave Clarke Presents go here.